With the new year we’ve taken some time to look back on what we have learned during 2016. Our main message to boat owners? Don’t sell your boat. Rent it to overnight guests with Beds on Board. We would like to share our experience with all boat owners, especially those worrying about the cost of ownership, or those thinking about selling their boat in 2017. Beds on Board was launched to help boat owners offset the cost of ownership. We saw that boats around the world were often vacant and often in amazing locations. The idea of a peer-to-peer platform was born. Today, bedsonboard.com allows owners to easily list their boats and communicate directly with guests. If they strike up trust then the owner can accept a booking and payment is processed. Beds on Board take only 5% of the fee. The owner sets this fee and all other terms, staying in complete control. Our vision is to be the world’s leading boat accommodation platform. We help grow the sharing economy by providing a peer-to-peer platform that allows boat owners and guests to deal directly for overnight accommodation. We help grow the boating economy by bringing new customers into contact with boats and marinas. We help grow the local economy by encouraging existing companies or entrepreneurial people to earn money by providing our members with whatever services they need for a great experience on board. Owners are renting their boats in marinas and waterways all over the world. Through sharing economy platforms like Beds on Board, directly and through 3rd parties. This is great as it means you don’t have to sell your boat. But, what we have learned is that it takes expertise to make the experience as safe and enjoyable as possible. We have worked with British Marine to publish guidelines for owners and have our own Guest Conduct Policy to ensure guests respect the boat, the marina and the environment. The Yacht Harbour Association invited us to speak at the World Marina Conference in 2016. The clear message was that the marine industry needs to be more open and accessible in order to find new customers. We’ve seen 2016 as the year when marina owners and trade associations start to embrace this idea. Therefore some marinas that didn’t support the idea have contacted us recently and are happy for owners to rent their boats now and others have a shared vision of what the future of marinas may look like. Owners won’t make a living from Beds on Board but we’ve met owners who earn enough to allow them not to sell their boats. We have seen owners pay their mooring fees after 6 months of renting with Beds on Board. We have seen owners covering their costs so that their time on the boat is effectively paid for – so it is free boating! Who is responsible for the guest during a stay with Beds on Board? A Beds on Board guest is a guest of the owner and so remains the owner’s responsibility at all times. All boat owners must have the appropriate insurance and we insist that owners talk to their insurers before renting their boat. We have relationships with most of the UK insurance companies, most of which provide cover at no extra cost. 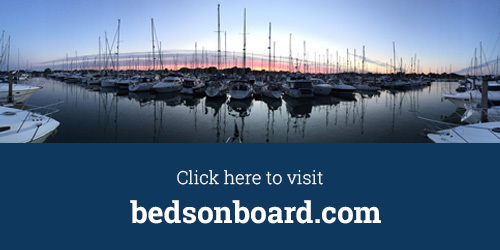 For any owners needing a policy, we have partnered with Haven Knox-Johnson to offer all boat owners a suitable policy via bedsonboard.com/insurance. How does the guest get to the boat? The owner, or their agent, will meet the guest and show them to the boat, if there are any security measures required then the guest will need these. All boats must have walk-on access so the guest can step safely ashore at any time. Beds on Board owners give thorough handovers so the guest knows how the boat works and what to do if something goes wrong. They always provide a contact number for the guest to call with any questions. And it’s really important to explain the rules and etiquette of the marina. We’ve seen that it gives you the chance to get to know your guests and establish some trust, which is one of our biggest learnings of the year, and that is trust. We’ve seen that trust works. It starts with communication, builds through knowledge and respect and ends with friendship. We have seen how owners help potential guests understand what it means to stay on a boat, what they should think about and even bring along. They use an anonymous message system on the Beds on Board website that allows the guests to ask questions confidentially, and for the owner to decide if the guest is right for them. We have seen owners share their knowledge and guests respond to that knowledge with respect for the boat and environment. The guests want to experience the boating lifestyle and part of that is understanding how things work. As a result, trust is established. Based on the mutual benefit for owner and guest. Once the booking is confirmed and the guests arrive then the knowledge continues with the meet and greet and getting the guest set up safely on board. And finally comes the friendship. It’s a key part of the sharing economy that strangers come together, enjoy the benefit of the transaction and end as friends. We see this through the amazing reviews and repeat bookings. Beds on Board will carry on meeting owners, marinas and marine associations around the world. We will continue to share our vision of a more open and accessible boating world. We will continue to help owners offset the cost of ownership. Our guest will continue to enjoy unique stays on boats all over the world. And you? Don’t sell your boat.